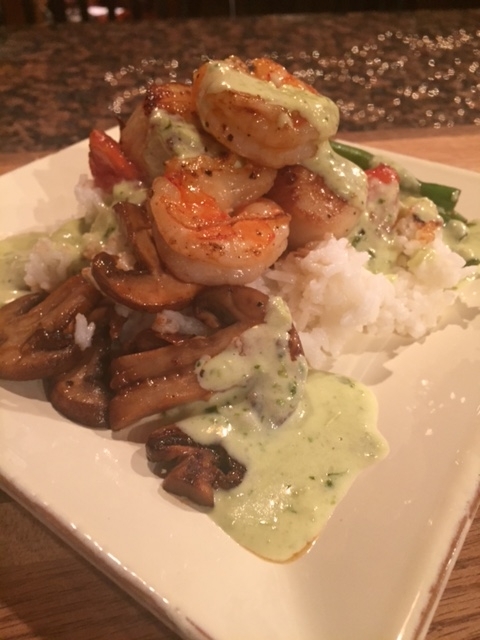 Scallops with Pesto Cream Sauce! 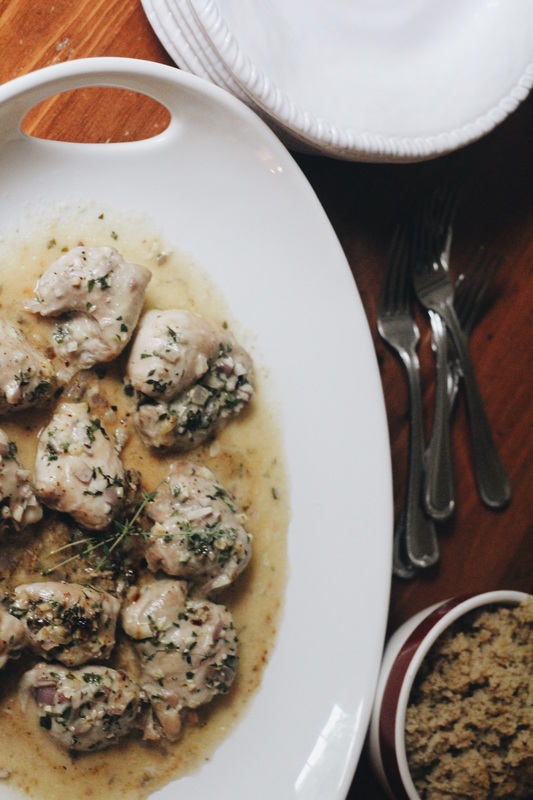 The key to this dish is pan frying the scallops perfectly, which is easy to do, once you learn a few quick things. The first is to buy the correct scallops. Make sure you go to a place that has great seafood. In the area, I go to Philbricks Fresh Market. 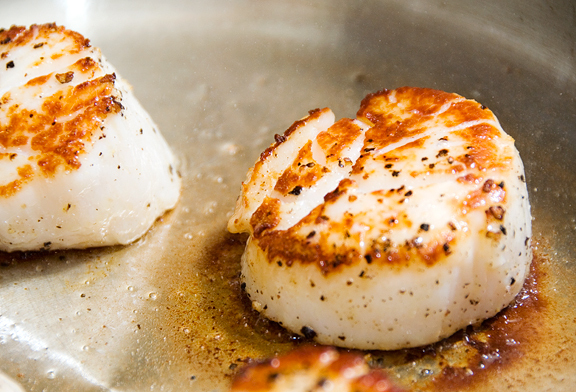 When buying scallops, make sure to get “Dry” scallops, this means they are not injected with water. If you use injected scallops, the water comes out while cooking and the food will boil – and you won’t get that nice crisp brown when you are searing them. Heat the pan up until it is very hot (don’t use a coated pan), add a little olive oil and gently place the scallops in the pan. Be patient… The browning creates a new flavor through caramelization called the Maillard reaction (which is the chemical reaction that gives browned foods their desirable flavor). When cooking scallops and shrimp, make sure not to overcook them. I take them off the heat when they are medium rare in the middle. They will continue to cook while they are out of the pan. 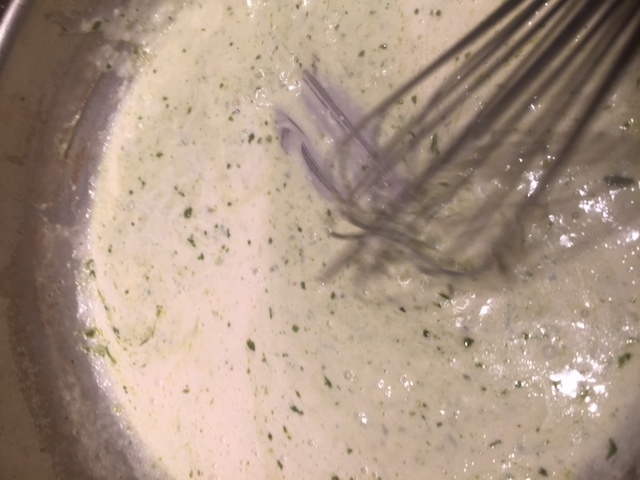 When you are making the pesto cream sauce, use the same pan that the scallops and shrimp were cooked in (don’t wash it! ), this will add a great flavor to the sauce. Good luck searing scallops! 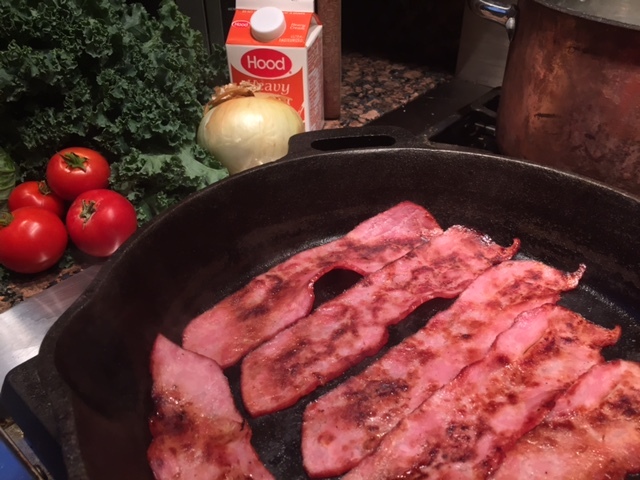 I recommend using turkey bacon as it’s far healthier for you than regular bacon…. Kale is great to cook with because it holds up so well under heat – and keeps it’s color. 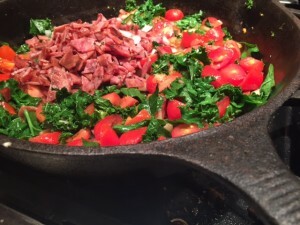 Slice up your kale, tomato, onion and bacon and let it simmer for a bit, but not too long! 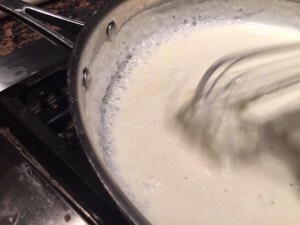 When you are making alfredo sauce from scratch, get the pan hot before you pour in the heavy cream. 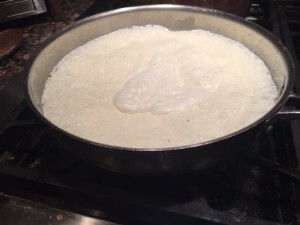 Add some salt and pepper… When it starts to boil and rise, add in some parmesan cheese and a tiny bit of roux (melted butter and flour used to thicken sauces) and whisk it quickly until it thickens to your liking. 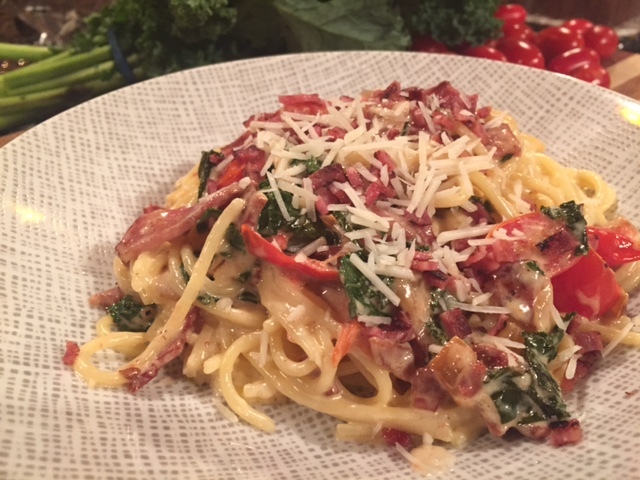 Mix the bacon, onion, kale and tomato with the alfredo and pour it over your plated pasta! Garnish with some extra parmesan cheese and perhaps some parsley. Enjoy! Gary Clark, Jr. The One Man Band playing at the 2013 Crossroads Guitar Festival… This is my favorite version of “Next Door Neighbor Blues”. I had the privilege of seeing Gary Clark, Jr. play this summer at the Casino Ballroom with my good friend Mike Lewis. Good times…. What an event we had tonight! 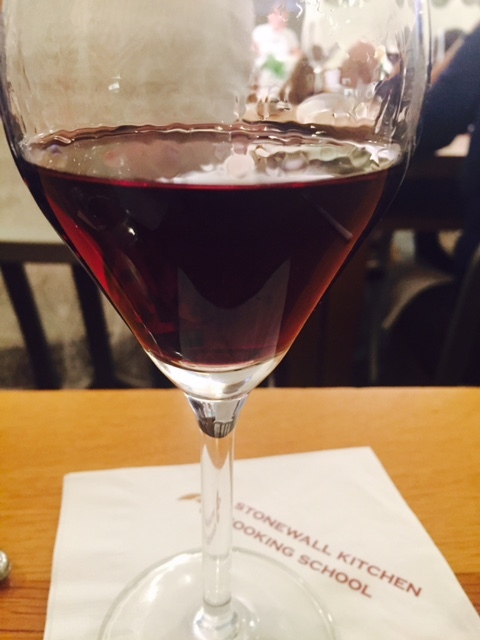 I have to thank all of the people at Stonewall Kitchen for putting on such a wonderful event. Everything was perfect! Thank you again to all of our guests for sharing an evening with us. 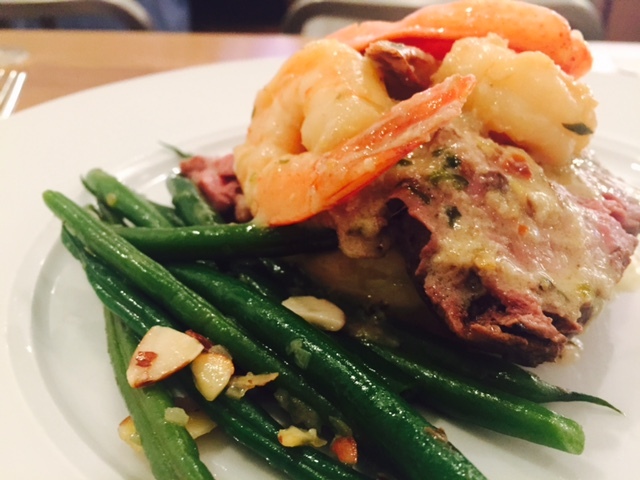 Tonight we had a Gluten Free Surf ‘n Turf menu, paired with wine – the Maine Way! A special thanks goes out to Jane St. Pierre, who was our chef instructor for the evening. The meal was over the top! Another special thanks goes out to Carla Snow, our sommelier for the evening, who did a wonderful job. Please take a look at her website A Grape Affair for more details on what she does! She blended the perfect wines with the perfect meal. If anyone would like a copy of tonights recipe packet, please send me an email at matthew.m.becker@gmail.com. 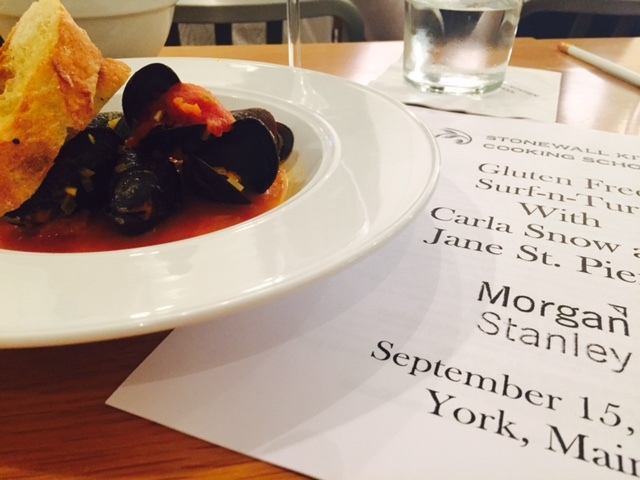 Our first course was Pan Steamed Bang’s Island Mussels in a White Wine and Saffron broth with Parmesan Crisp Paired with Celestin Blondeau Sancerre Savignon Blanc, France. These were amazing, the broth was to die for. Our main course was a Slow-Cooked Beef Tenderloin topped with a Pink Peppercorn butter and Shrimp & Lobster Scamp of Garlic and Fresh Herbs. This was on top of Mashed Potato Gratin, with Haricot Verts Almondine (French string beans with almonds). 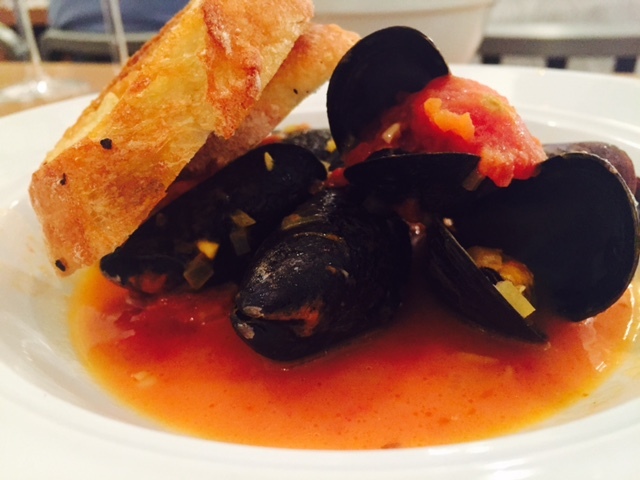 This dish was paired with Tortoise Creek “Le Charmal” Syrah/Grenache, France. I must say, this was unreal. When they said, “Surf ‘n Turf – the Maine Way”, they weren’t kidding! It was brilliant. 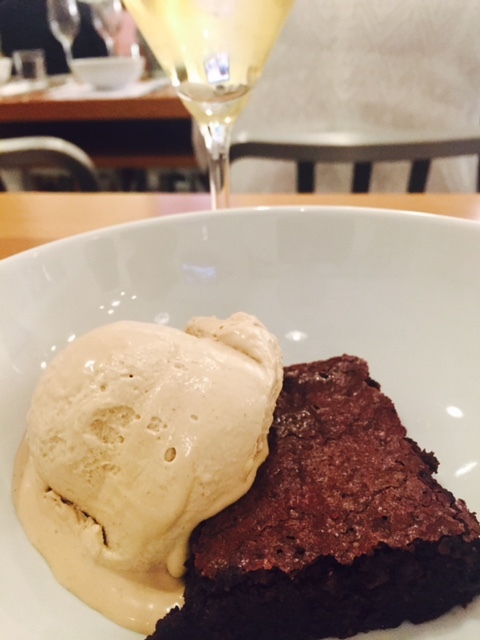 Now, on to the dessert…. I’ve been gluten free for over 20 years and this was one of the best desserts that I’ve had – Hazelnut Brown-Butter Brownies with House-Churned Coffee Ice Cream, paired with Guy Chaumont Cremant de Bourgogne Blanc Brut, France, an excellent sparkling wine that rivals the finest Champagne! I learned something new tonight about Champagne – if you pop the cork and the Champagne flows out, it means that the Champagne was not cold enough! Don’t store your Champagne in the refrigerator, but let it cool in the fridge for 3-4 hours before you open it, it will make all of the difference in the world! Ava is becoming a master in the kitchen! 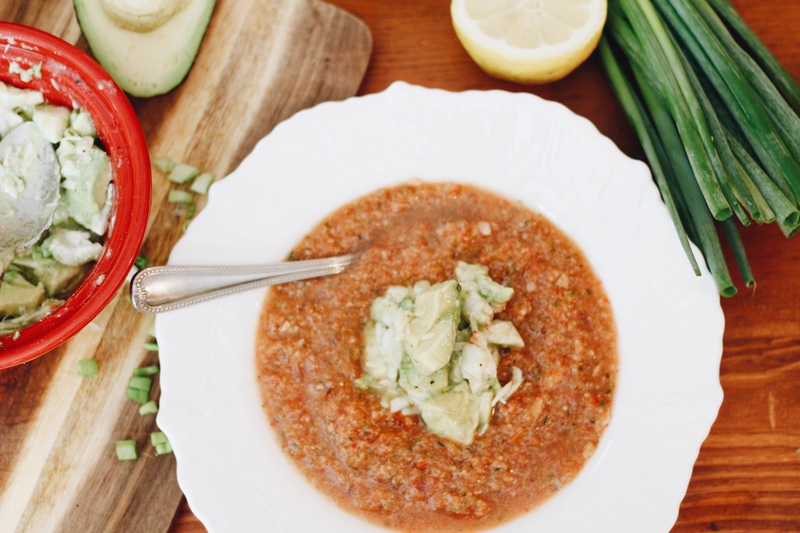 With a focus on healthy food, she’s become a pro at several things. I think her favorite is to make custom omelette’s for the family. Below is a perfect example of one of her specialty salads. Mixed greens with fresh tomato, cucumber, strawberries and teriyaki chicken. Her favorite salad dressing is Ranch dressing, but only a touch! I personally like the Fartacus tee shirt! 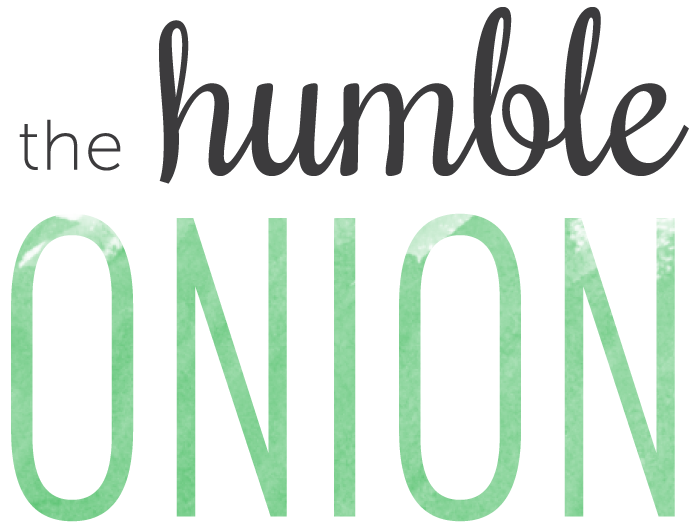 There’s nothing better than watching the Phantom Gourmet on a weekend morning, preferably AFTER you’ve eaten, because if it’s before, you’re likely to jump in the car and find some good food to eat! The Kitchen on Islington Street in Portsmouth is a great spot. 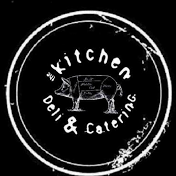 Take a look at thekitchennh.com to check out their menu. 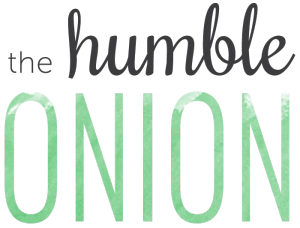 They have many Gluten Free options on the menu and a wide variety of sandwiches, burgers, signature dishes and salads. I’ve gotten to know this restaurant through Morgan Stanley, where on occasion they will deliver lunch to the office. I’ve never seen such a perfect tray of salmon and chicken to go on top of the salads that they bring. My favorite salad there is the Spinach Salad, which has candied walnuts, strawberries, pickled red onion, goat cheese and a honey mustard vinaigrette balsamic reduction. 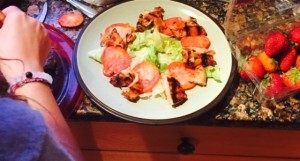 Try it with a piece of salmon on top! Take a look at the video below, you’ll want to get in your car and go! “Loving Cup” closes the first half of Exile, punctuating a tumultuous, ragged half-hour of rock & roll with a shot of mountain-climbing redemption and lyrical warmth. Originally attempted at London’s Olympic Studios during the Let It Bleed sessions, then revived and finished in early 1972 in Los Angeles, it’s one of several gospel-steeped Exile songs that didn’t come out of the band’s hazy time at Nellcôte. This may account for its very un-basement-y maximalism: Nicky Hopkins’ majestic piano comes on like clouds parting, and the song seems to gather momentum and emotional power as it gathers influences. Jagger goes from self-deprecating come-ons (“I am nitty-gritty and my shirt’s all torn/But I would love to spill the beans with you till the dawn”) to innocent elation (“Feel your mouth kissing me again/What a beautiful buzz”) in a country drawl. The bright soul horns and a backing choir (which probably included an uncredited Gram Parsons) enhance the song’s sense of deeply spiritual gratitude. This is the biggest oyster I’ve ever seen! My favorite place to buy oysters is Seaport Fish Market. Not only is the fish incredibly fresh, but Seaport Fish is a big supporter of Big Brothers Big Sisters of New Hampshire. Each year, they supported our event, The Big Bash on Little Bay with a full service, all you can eat oyster bar. Last year they served over 600 oysters to our guests! 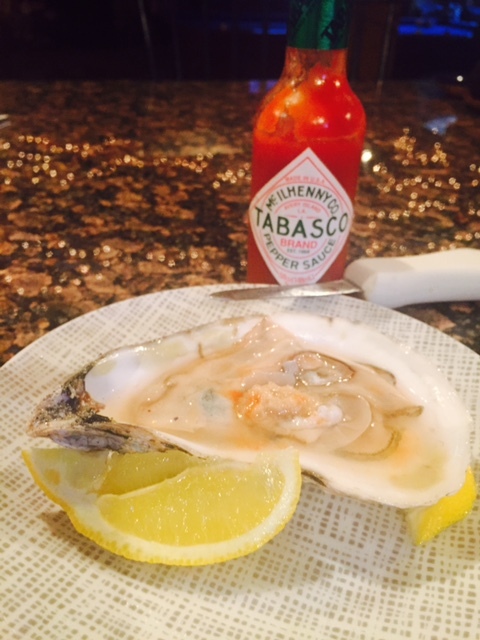 Nothing beats a fresh oyster with a touch or horseradish, lemon and a splash of hot sauce!